Indian Ocean Arabian Sea Coast of British India Arnala Island to Khanderi Island including Bombay Harbor. 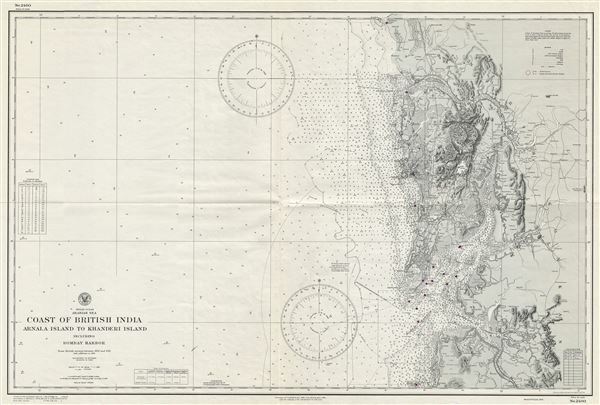 This is a scarce World War II (WWII) era 1945 map of Bombay (Mumbai) harbor and vicinity issued by the U. S. Navy Hydrographic Office. It covers the western coast of what was then British India, from Arnala Island to Khanderi Island and inland as far as Kalyan and Bava Malang (Baba Malang) or Malanggad. Based on British surveys between 1855 and 1921 with additions to 1934, this chart offers extraordinary detail throughout including topography. The map shows considerable inland detail for a nautical chart, noting railways, rivers, towns, hills, etc. Bombay City in particular is beautifully detailed with streets, individual buildings, docks and forts noted. Countless depth soundings are noted in fathoms. The chart also notes several lights, buoys, radio beacons and notes on tides. This is the sixth edition of the chart first published in 1908. This particular map was printed in 1944 with small corrections and contains manuscript corrections dating to 1945. This map was prepared in 1944 as chart no. 2460 by the U.S. Navy at the Hydrographic Office under the authority of the Secretary of the Navy.